Share the post "Basil Or The King Of Herbs: Growing Tips, Culinary Uses, Health Info"
Basil or Ocimum basilicum, also called great basil or Saint-Joseph’s-wort, is considered one of the healthiest herbs and extensively used in culinary. It belongs to the family Lamiaceae (mints). Basil is also called the “king of herbs” and the “royal herb”. The name “basil” comes from Greek basilikón phutón, “royal/kingly plant”. Basil is possibly native to India, and has been cultivated there for more than 5,000 years. This herb was thoroughly familiar to the Greek authors Theophrastus and Dioscorides. Basil is a hardy annual plant (some are perennial in warm, tropical climates, including holy basil and a cultivar known as “African blue”), best known as a culinary herb, very prominent in Italian cuisine, and also plays a major role in Southeast Asian cuisines of Indonesia, Thailand, Malaysia, Vietnam, Cambodia, Laos, and Taiwan. • Sweet basil (or Genovese basil) is used in Italian food. • Thai basil (O. basilicum var. thyrsiflora) is used in Thailand. • Lemon basil (O. X citriodorum) is widely used in Indonesia. • Holy basil (Ocimum tenuiflorum) or tulsi, a revered home-grown plant in India and Nepal. Most of the Asian basils have a clove-like flavor that is, in general, stronger than the Mediterranean basils. Basil is most commonly used fresh, as cooking quickly destroys the flavor. It is better to add it at the last moment. You can keep the fresh herb for a short time in plastic bags in the refrigerator, or for a longer period in the freezer, after blanching it quickly in boiling water. The dried herb also loses most of its flavor, and what little flavor remains tastes very different, with a weak coumarin flavor, like hay. “Genovese”, “Purple Ruffles”, “Mammoth”, “Cinnamon”, “Lemon”, “Globe”, and “African Blue” are the most commonly used Mediterranean basil cultivars. Basil is one of the main ingredients in pesto — a green Italian oil-and-herb sauce. In China basil is also used fresh or dried in soups and other foods. In Taiwan, people add fresh basil leaves to thick soups. They also eat fried chicken with deep-fried basil leaves. Basil (most commonly Thai basil) is commonly steeped in cream or milk to create an interesting flavor in ice cream or chocolates (such as truffles). Thai basil is also a condiment in the Vietnamese noodle soup. Basil flower buds can be also used in culinary. They have a more subtle flavor. Basil plants are easy to maintain outdoors and indoors. Basil is very sensitive to cold, so it grows best in hot, dry conditions in a well-drained soil. This is an annual plant if there is any chance of a frost. In Northern Europe, Canada, the northern states of the U.S., and the South Island of New Zealand it will grow best if sown under glass in a peat pot, then planted out in late spring/early summer (when there is little chance of a frost). Additionally, it may be sown in soil once chance of frost is past. In sunnier climates such as Southern Europe, the southern states of the U.S., the North Island of New Zealand, and Australia, basil will thrive when planted outside. It also thrives over the summertime in the central and northern United States, but dies out when temperatures reach freezing point. It will grow back the next year if allowed to go to seed. Plants will need regular watering, but not as much attention as is needed in other climates. Basil can be grown indoors in pots and, like most herbs, will do best on an equator-facing windowsill. It should be kept away from extremely cold drafts, and grows best in strong sunlight, therefore a greenhouse or row cover is ideal if available. It can, however, be grown even in a basement, under fluorescent lights. If its leaves have wilted from lack of water, it will recover if watered thoroughly and placed in a sunny location. If you notice yellow leaves towards the bottom of the plant, it is an indication that the plant has been stressed. Usually this means that it needs less water, or less or more fertilizer. or from cuttings – just put the stems of short cuttings for two weeks or so in water until roots develop. Once a stem produces flowers, foliage production stops on that stem, the stem becomes woody, and essential oil production declines. To prevent this, snip off budding heads whenever they appear. Picking the leaves off the plant helps promote growth, largely because the plant responds by converting pairs of leaflets next to the topmost leaves into new stems. Basil also is considered one of the healthiest herbs with an impressive list of nutrients. Vitamin K, essential for blood clotting, is one of them. Basil essential oil (sometimes called “sweet basil oil”) is used to heal various wounds and infections, and as a calming agent to combat inflammation, reduce adrenal fatigue, and treat nerve and muscle conditions. 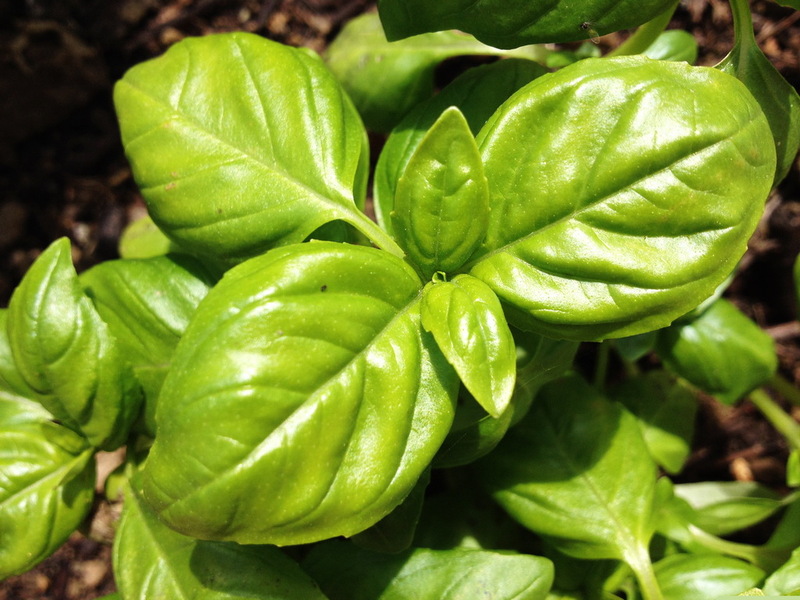 Other vitamins and minerals in basil include iron, calcium, manganese, magnesium, vitamin C and potassium. Basil also has antibacterial properties and contains DNA-protecting flavonoids. Some antibiotic medications which have been found to be resistant to some of these strains have been inhibited by basil extracts. One of those oils – eugenol – can block the activity of the harmful enzyme cyclooxygenase (COX). This same effect puts basil in the “anti-inflammatory” category because it provides relief from related problems, such as rheumatoid arthritis. Read more here. Do you grow Basil in your garden or indoors? What is your experience with this plant? Please share with other fellow gardeners in the comments below! Do you sell Basil seeds or have plants for sale? You can place your advertisement here. Contact us now!